It’s that time of the year. Soon, the scene at Harry’s will be back in full swing. And you know what that means? Great food, great views, and great music! 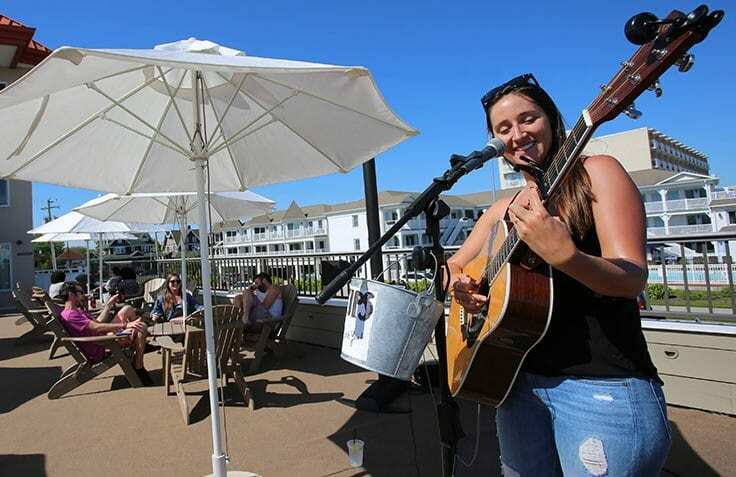 Harry’s boasts the only ocean-side rooftop bar in Cape May, with panoramic views of the Atlantic Ocean. Plus, Wednesday through Sunday, every week, Harry’s offers outstanding live music. Couple that with outstanding food – what more could you ask for? Nicki Sbaffoni surprises and delights audiences with her powerful and creative versions of favorite songs. Her eclectic song menu includes close to 500 hits from all genres and eras. Nicki has been a song writer and performer for more than half her life. As summers approach, you’ll find Nicki playing shows up and down the Jersey shore and year-round performing in neighboring cities. The Change is more or less Harry’s house band as Montreal Beach Resort owner, Harry Hirsh, is the drummer! With a classic cover song list from the 60’s and 70’s, The Change brings Woodstock to Harry’s a few special nights every summer. Celebrate the 4th of July at Harry’s with the E-Street Shuffle. For the 6th year in a row, our rooftop deck will rock with the best of the Boss. The E Street Shuffle offers true dedication to authenticity for a knock-your-socks-off, high-energy stage show. The E Street Band that is like no other. This group of local Cape May musicians got together at a BBQ in 2015. Since then, the guys have written and performed their own music as well as that of their favorite artists. Celebrate the music of Jerry Garcia and The Grateful Dead. One of the area’s premier Grateful Dead tribute band, Dead Reckoning has delighted dead-heads all over the jersey shore and more. Jack Light Move is reggae-rock-funk-soul infusion group from Philadelphia that is dedicated to will wow you with renditions of your favorite reggae songs. These guys will make you make you feel just like you’re in the islands. Marnie and Nate play rock, blues, country and folk songs with a soulful and powerful twist. Marnie’s voice is mesmerizing and Nate is a fantastic guitarist who holds down great rhythm. His pitch-perfect harmonies add to their special sound. Que is a self-taught multi-instrumental musician who infuses all his shows with the art of live looping. He’s a versatile musician whose set lists include a diverse selection of musical genres like classic rock, reggae, and country. He also has an uncanny ability to connect with his audiences. Rich is a self-taught guitarist who draws his tastes and influences from the music of the 90s and 2000s. He plays classic and alternative rock, hip-hop, rap, pop, folk, and reggae! He played his first show in 2007, and has been performing ever since. Rich’s main influences are Dave Matthews Band, Chris Cornell, Neil Young, John Mayer, The Beatles, Jack Johnson, Pearl Jam, Bon Iver, Bob Marley, Jimi Hendrix, Eric Clapton, Queen, Sublime, and many more. Come celebrate the music of Woodstock ’69, 50 years later. Made up of a collection of talented local musicians, Drift-Woodstock will transport you back in time to the country’s most heralded music event. Join us for a night of Peace, Love & Music. Stay tuned for more! We’ve got even more great artists coming to you this summer. Visit our Entertainment page for a complete preview of all our spring, summer and fall entertainment. And join us this season. Eat drink and be Harry.